After the conclusion of an unhappy business relationship with MGM in which Buster Keaton realized he’d have to surrender artistic control and his own passion for tackling dangerous stunts himself, the former silent film legend journeyed to Europe to make two independent films. Yet fortunately for us, he didn't stay away too long as Keaton returned to Hollywood and signed a partnership with Educational Pictures, for whom he completed sixteen two-reel shorts in the period over the three years from 1934-1937. Although Keystone Kops mastermind Mack Sennett could be found behind the lens of the ’35 short, “The Timid Young Man,” Keaton’s work for the studio was primarily helmed by Educational’s “top” director Charles Lamont in roughly twenty minute comedies that found his signature talkie character Elmer Butterworth mostly wandering from job to job, falling under the spell of pert blondes with toothpaste smiles, and trying to stay out of trouble as much as his notoriously clumsy persona would allow. 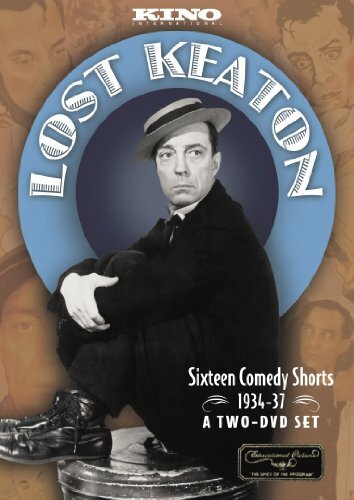 Remastered from the original 35mm film negatives and grain masters that were derived from Keaton’s own collection, this two disc DVD set serves up all sixteen titles in chronological order complete with film notes by The Sound of Buster Keaton author David Macleod along with a stills gallery and a musical montage of the man’s greatest stunts, pratfalls and physical gags. While Lost Keaton may suffer slightly from the age of the prints as missing frames pervade in the short “Mixed Magic” and the volume at times needs to be cranked to make out the dialogue from the pops and hisses of the audio track, overall it’s a remarkable look at the man’s little seen and seldom explored talkie period in the mid ‘30s in some shorts that hark back to gags for which he was most famous in his prolific 1920s era. Moreover, it’s a fascinating document of the man’s career before Columbia – perhaps inspired by his work in this collection – hired Keaton to complete two-reel comedies for their studio after his time at Educational Pictures was completed. And even though there’s much to admire throughout, certain shorts just beg for repeat viewings. In fact, the title’s kick-off of “The Gold Ghost,” which finds an unappreciated Elmer pinning himself the sheriff of Vulture County after the Massachusetts native travels out west to a dusty, desolate Nevada town that’s about to boom once more is a gem right off the bat. Similarly, you're sure to enjoy “One Run Elmer” that again pits the lonely, deserted Elmer against surprising competition when his desert gas station in the middle of nowhere gains a rival petrol station directly across the street. Lost Keaton also proves to be very reflective of its time period as the second disc discovers Elmer moving from opposite sides of the country into various jobs from fireman to magician’s assistant and chemist as he tries to eek out a living any way he can. Admittedly of course there’s no duplicating his most beloved work in American cinematic classics like The General and Sherlock Jr. Likewise, although we do wish that he may have had a bit more creative control over the pieces than he did – regardless of the fact that it was a step up from his time at MGM – this lovingly preserved Kino International release is sure to keep fans both in stitches. Furthermore, we remain routinely impressed by his unfailing sensibility for just which type of sight gag or carefully worded phrase would ensure the overall best result for his devoted audience who were with him every step or pratfall of the way.